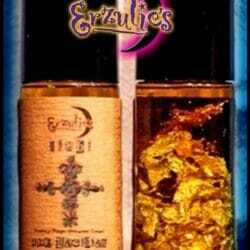 Perfume Oils, Spiritual Perfume Oils & Gemstone Perfume Oils ~ Protective Goddess Perfume Oils! Erzulie-Danto is the fiery, fierce protector of women and children, especially those who are abused, in danger, neglected or in very difficult environments. 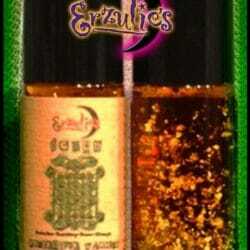 Erzulie-Dantor provides power, strength and protection to those who seek her assistance. As the maternal Lwa, she is very helpful with fertility, keeping the family unit stable and child-rearing – especially for those who are struggling! Apply our exquisite perfume oils to draw protection, strength, stability, help with fertility, healing from abusive relationships or environment and save the gemstones for your sacred space when finished. These precious, highly concentrated, pure essential perfume oils just encapsulates strength & power with a hint of femininity. Blended with 100% pure essential oils of Blood Orange, Wild Harvest Haitian Vetiver, Vanilla & Sandalwood Absolute Oils then bottled with Precious Blue Lapis Lazuli gemstones to enhance her powerful vibration. 15ml Colored Roll On Bottles.